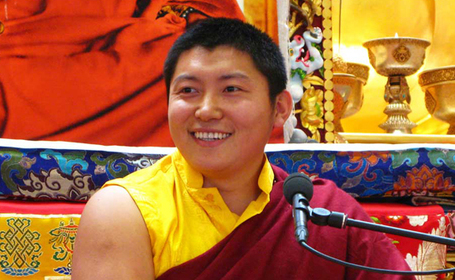 Born in 1981 into an illustrious Tibetan Buddhist family of great masters, dynamic and personable Kyabgön Phakchok Rinpoche sustains a long unbroken history of far-reaching spiritual accomplishments throughout his seven incarnations. Kyabgön Phakchok Rinpoche is one of the throne-holders of the Riwoche Taklung Kagyu Lineage and a lineage holder of the Profound Treasures of Chokgyur Lingpa from the Nyingma School of Early Translations. Recognized by the Kagyu regents and ordained by His Holiness the Dalai Lama, from a very young age Kyabgön Phakchok Rinpoche embarked on a classic Buddhist education under the tutelage of many of the most outstanding enlightened lamas of our time. Rinpoche entered the Dzongsar Institute of Advanced Buddhist Studies, in Bir, India in order to further pursue his studies. After some years, Rinpoche offered back his monastic ordination and married in order to continue his family line. Presently, Kyabgön Phakchok Rinpoche is the Vajra Master of Ka-Nying Shedrup Ling Monastery, abbot of several monasteries in Nepal, assists monasteries and practice centres in Tibet, heads dharma centers in North America and Asia, and teaches widely at various centres in the United States, Canada, Europe, South America, and South-east Asia. He energetically oversees a wide range of humanitarian projects in South Asia through the non-profit organization, the Chokgyur Lingpa Foundation where he stands as the Director. Rinpoche’s teachings are direct, lively, and practical with a strong emphasis on the view of the Great Perfection, the uncontrived non-conceptual meditation of Mahamudra, the tireless implementation of the Bodhisattva’s conduct, and the Mahayana’s teachings on wisdom and compassion. In his teachings, Rinpoche always stresses the importance of going back to the root of the Buddha’s sutras and the treatises of the great India masters. In this light, Rinpoche is also overseeing the translation and printing of several sutras and treatises, as well as other dharma texts.